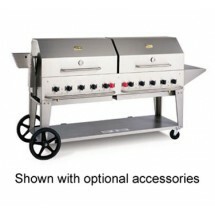 Charbroil grills are very important commercial kitchen equipment items. They provide a way to prepare everything from fish, poultry, meat, and vegetables, to pizzas, desserts, and more. For outdoor catering events, charbroil grills provide a source of entertainment for guests, while ensuring the barbecue allows the meat to be as hot and freshly prepared as possible. In addition, barbecue and charbroil grills provide a cooking technique widely embraced for its smoky flavor and appreciated for the required skill of preparation. Depending on the type of venue in which the food is being prepared, and whether or not it is for an event, different charbroil grills will be the best fit. Venues planning to offer an on-site barbecue station while catering events should choose a grill for its size, as well as its presentation. On the other hand, venues should on counter space, and planning to use charbroil grills in-house, will probably prefer a basic, free-standing piece of commercial kitchen equipment. Venues worried about floor space, but not counter space, can purchase counter-top grills. The char broil grill review below summarize four different varieties, among the many, available at Tigerchef. 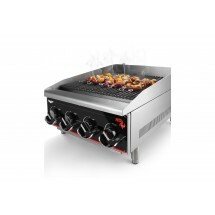 Size 10 burners 24" 15" 24"
Comments This grill is one of the best options out there for catering businesses. 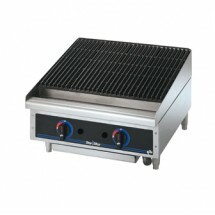 There are smaller versions of the grill by this company, for restaurants and caterers looking for a smaller barbecue. 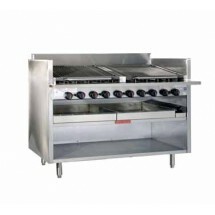 For restaurants looking for commercial kitchen equipment, this type of grill is a good option because it puts an emphasis on convenience. There are both floor and countertop options available, making it workable in a large kitchen. Star charbroil grills are usually highly rated in char broil grill reviews. These charbroil grills come in larger size options as well, making it easy for venues to find the one that is right for them. These charbroil grills are solid options for food businesses planning on high use of their charbroil grills. The reversible great is extremely convenient during service in restaurants, when restaurant staff may not have time to wash the plates between ingredients.